The NHL Hockey campaign always finds the last two weeks of regular season play holding some of the most exciting competition in all of sports, and with today’s NHL schedule packed with games that will inevitably weigh on the NHL playoffs to come, tonight’s match-up between the Los Angeles Kings (37-27-12, 86 points) and the Calgary Flames (35-27-15, 85 points) is a perfect example of what makes hockey such a great sport. Two teams separated by just one point in the Western Conference playoff standings get set to duke it out amidst a 5-team race for the final two spots in the playoff picture where just two points separate 7th from 11th. That makes tonight’s 9:30 PM ET face-off at the raucous Scotiabank Saddledome in Calgary, Alberta, Canada just that much more of an intriguing match-up, and a great option for sportsbook bets at one of the best online sportsbooks reviewed here. After surging down the home stretch and winning 6 games in a row to move into first place in the tightly contested Pacific division, the visiting Los Angeles Kings find themselves on the heels of two straight losses, and a must-win game tonight. With the San Jose Sharks in action tonight and sitting 2 points ahead of them in the Pacific division, as well as the Dallas Stars playing at Edmonton (1 point ahead of the Kings, currently occupying 7th though tied with Phoenix, currently in 8th), this is without a doubt a critical match-up for the Kings, who need a win to get back on track after dropping games to the Boston Bruins and the Vancouver Canucks this week. Scoring goals has once again become an issue for Los Angeles, as despite their defense getting back on track in Vancouver (a 1-0 loss on Monday), their offense continues to struggle to get good-looking shots on goal, despite a range of talented goal scorers and puck movers. Facing Calgary’s talented netminder Mikka Kiprusoff won’t make the goal scoring task any easier, as the Kipper is 19-8-3 with a 2.02 goals against average versus the Kings. While the Kings do manage to put up a hefty number of shots per game (30.45), in the last two games against stand-up defensive units, they have struggled to find good looking shots that have real potency behind them. Therefore, it will be critical to the Kings game plan in a hostile environment to not only keep the puck in the Flames zone, but focus more on putting hard shots on goal and less on trying to move the puck around too much. If there is one area of Los Angeles’ scoring attack that has been notably lacking, it’s their presence in front of the crease. It’d be great to see a big body like 6’4″ Dustin Penner in front of the net whacking away at loose shots on goal, but typically we’ve been more likely to see captain Dustin Brown (6’0″) battling it out with much bigger defenders. L.A. has to find a better way to get their big bodies at the net, and clog up Mikka Kiprusoff’s line of sight. For Calgary, the season looked to be all but over after their poor run of form coming into last weekend, going 0-2-3 in the five games prior to Monday. However, with a clutch 5-4 win against Dallas on Monday (which effectively helped the Kings as well), Calgary comes into this game in a similar do-or-die mode, but they may have the confidence factor on their side at home, where they’ve gone 5-0-1 in their last six games. Further, Calgary has historically owned the Kings on their home ice, winning 10 games in a row there, though they’ve dropped the last two meetings at home against them this season. For the Flames to have success tonight at home against a very good Los Angeles defense that is allowing just 2.1 goals/game (2nd in the NHL), and has the league’s 4th-best penalty killing unit, concentration must be placed on the transition game, and getting at Los Angeles while on a rush. Los Angeles is very fast on defense, so trying to dump the puck into the L.A. zone and move the puck around typically doesn’t work well, as the Kings recover quickly, and are extremely pesky with their stick movement. Led by top defensemen Drew Doughty, Willie Mitchell and Rob Scuderi, Los Angeles has the speed and tenacity to catch up and work over any sized opponent, and prevent good open looks at goaltender Jonathan Quick, who himself has been one of the best goalies in the league this year. In the face of such a shutdown defense, and keeping in mind Calgary’s relatively low-scoring offense (2.4 goals/game, 25th in the NHL), more emphasis will be placed on getting the Flames’ top goal scorers the puck tonight, which means seeing a lot of shots coming via Jarome Iginla (31 goals, 33 assists), who hasn’t scored a goal in 6 straight games, as well as Olli Jokinen (22 goals, 37 assists), who has just 1 point in his last 8 games. Without contributions from these two top scorers, Calgary is going to have it’s hands full in a hectic, low-scoring match-up against a very good defensive team and a very good goalie who is tied for second in the league with 8 shutouts on the season. Los Angeles needs to get its top line back in scoring form, and that means getting leading scorer Anze Kopitar back into the scoring mix. Kopitar has been held to just 3 combined shots on goal in the last two games, and getting him more looks in front of the Calgary net will be critical tonight. Along with Kopitar, it’s again high-time that the former Philadelphia Flyers duo of Jeff Carter and Mike Richards got their act together. Richards as well has just 3 shots on goal in the last two games, and while Carter has been much more active taking shots (11 in 3 games), he’s failed to gain a point in each of those three contests. Without someone amongst the top scorers being productive tonight, once again tons of pressure is going to be heaped on the defense, and in particular Jonathan Quick. There is no doubt that the Kings have plenty of talented goal scorers, with captain Dustin Brown and Justin Williams both on the verge of their second-straight 20-goal seasons, and with a cast of defensemen that are all capable of scoring, but it’s been an issue of taking quality shots and getting big bodies at the net that has really set the Kings back in the scoring department this year. There’s no question that goals are going to be hard to come by in this hostile Calgary environment tonight, but the game will get even harder for the Kings both physically and mentally if they can’t rally behind the step-up play of one of their top players. 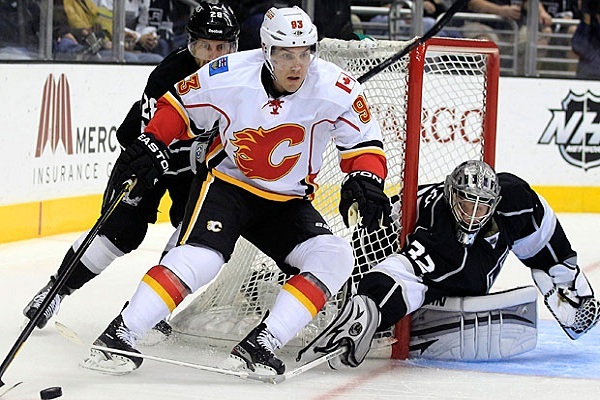 This tight match-up between Western Conference foes finds the host side Calgary Flames getting the very slight underdog on the money line, with +102 odds to win at home, while the visiting Los Angeles Kings come in as -113 favorites in this road match-up. Going 5-0-1 in their last 6 games on home ice, as well as holding a 10-1-1 record against the Kings there in their past 12 games, Calgary looks to be the best bet straight up on this game, especially considering the necessity of a win on home ice to stay relevant in the Western Conference playoff picture. Against the spread, this game is expected to be a tight one by virtue of the spread line, as Calgary has 1 1/2 goals to give at high -330 odds, while the Betonline bookmakers aren’t expecting the Kings to score enough goals to beat the spread, with -1 1/2 goals to beat at +275 odds. With two solid defenses and two goalies that will be hell bent on pitching a shutout tonight knowing that just 1 goal could decide the match-up, the spread bets will be a tough pick for all but the most confident of bettors. Carrying over to potential wagers on the total points line, the over/under against stands at 5 goals as two of the league’s top goalies sitting behind two very good defenses square off. Both teams are not known for scoring many goals (the combined season average for both teams is just 4.64 goals/game), so playing the average would find you wagering to the underside of the points total tonight. There should be nothing left on the ice once these two teams are done tonight, as both sides know full-well just how important the two points are from this game heading into the final 5 games of the season. While the Kings have to find their shooting form and put up more than just 1 or 2 goals to walk out of the Saddledome with a win, Calgary as well has to find ways to penetrate the tough Kings defense, or else find themselves mired in an anxious fight towards the closing minutes of the 3rd period. With both teams putting more emphasis on scoring goals tonight, the quicker team that can get a hold of loose pucks and move down-ice in transition will have the upper hand, and that seems to point at the more talented Kings in tonight’s match-up. We’ll put a stake in the ground taking Los Angeles to squeak by with a win in Calgary, in a low-scoring 2-1 game that just might head to overtime to make it that much more interesting.